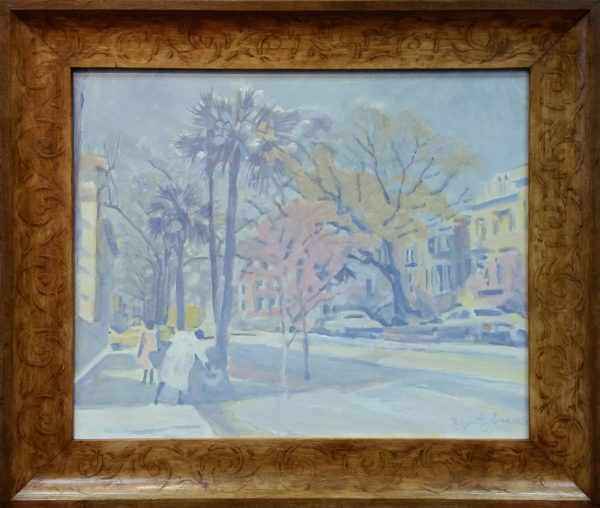 Myrtle Jones (1913-2007) was born in Winder, GA and lived in Savannah, GA where she studied at the Telfair Academy with Emil Holzhauer. She then studied with Reuben Gambrell (from University of GA), Ferdinand Warren (from Agnes Scott College), Bill Hendrix (of St. Simon’s Island) and Leonard Delonga (also of University of GA). By 1959 she was teaching. She was a member of the Savannah Art Club. She became acquainted with local painters Rebekah Sauders and Leonora Quaterman and Hattie Saussy. She and Saussy became lifelong friends often painting together in and around Savannah. She exhibited with the Savannah Art Club and the Association of Georgia Artists. Her painting, “Rooftops” won first prize in an exhibition at the High Museum of Art in Atlanta.